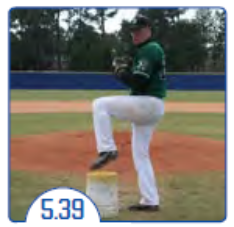 To reinforce pitchers staying balanced as they raise their knee to start their delivery. 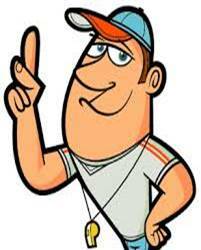 Coach has one ball to hand to pitcher standing on mound. Catcher at plate ready to receive pitch. 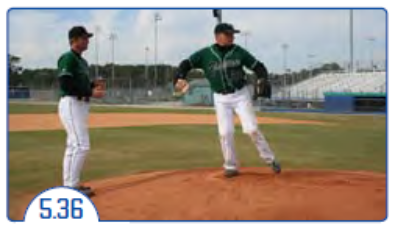 Coach stands beside pitcher and hands pitcher a ball when the pitcher is in the balanced position (with knee up). Pitcher takes ball from coach’s hand and pitches the ball. Catcher throws ball back to catcher who gives ball back to coach. Make sure pitcher gets into a good, quality balanced position that they can hold for a couple of seconds before you hand them the ball. Coach has one ball to toss to pitcher standing on mound. 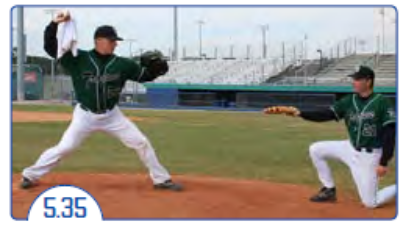 Coach stands behind pitcher and hands pitcher a ball when the pitcher is in the balanced position (with knee up). Helps a pitcher emphasize the extension and finish elements of the pitch. Using a hand or dish towel, tape (or use an elastic band to hold) a goal ball in the centre of the towel. Have the player hold the ball between the index and middle fingers to create a realistic action of the snap and finish of the throw just like a baseball. Have a coach kneeling in front of the player holding a glove and have the player hit the glove with the towel. Make sure the player is getting good extension. Make sure the player explodes the hips to generate good arm speed. Emphasizes the correct back and front arm action to the back side. Helps to detect the players who like to hook the ball behind or get their front shoulder turned rather than in line with the plate. Coach stands directly behind the pitching rubber. One ball drill: Player tosses the ball on the back swing to the coach so that the ball goes up and straight back. Two ball drill: Player holds two balls in the throwing hand and tosses the ball closest to the wrist on the back swing to the coach and delivers the other ball to the plate. Player keeps his shoulders in line with the plate. Ball goes up and straight back. 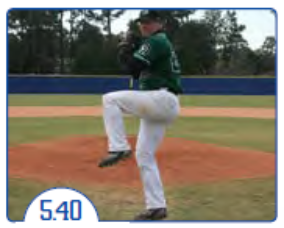 Phase 1: Emphasizes the correct drop step, pivot, and dynamic balance in the pitcher’s deliver. Phase 2: Emphasizes correct separation and tempo. Phase 3: Emphasizes correct hip load, release and throw. Phase 4: Ties the three phases of the mechanics drill together. Phase 1: Windup: Drop step, pivot, balance. Stretch position: Set position, balance. Phase 2: Windup: Drop step, pivot, balance, three separations (hands and legs separate) and on the fourth one deliver pitch. Stretch position: Set position, balance, three separations (hands and legs separate) and on the fourth one deliver pitch. Phase 3: Windup: Drop step, pivot, balance, power, load hips and deliver pitch. Stretch position: Set position, balance, load hips and deliver pitch. Phase 4: Repeat phase 1 through 3 twice each. 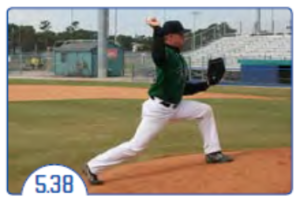 Helps a pitcher emphasize correct direction and momentum in his delivery while landing on a flexed but firm front leg. This drill is great for players who lock their front knee when delivering a pitch. Player lines up behind the mound three shuffles away. Shuffles up to the back of the mound hill and delivers the ball. Make sure the player does not lock out on the front leg. Helps a pitcher emphasize correct balance and hip load in his delivery. Find a bucket that is not too high for the player. A bucket that when stepped on puts the leg in the natural balance position. On flat ground, player places toes of front foot on top of bucket and gets into the balance position. From the balance position, the player does the hip load, delivers the pitch and with the back leg knocks over the bucket. This is an advanced drill due to the body control and balance that it takes to execute properly. This drill emphasizes direction and momentum into a pitch while keeping the pitcher’s weight over the back foot for as long as possible. On flat ground, player starts in set position and then moves to balance position. Player take three hops on back leg and then delivers pitch. Helps a pitcher focus on a controlled lateral movement and direction in his delivery. 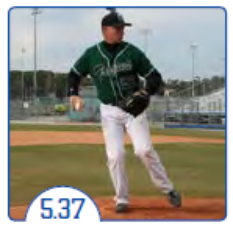 Draw a right angle ( or T line) out from the pitching rubber directly in front of where the pitcher stands. Pitcher makes the pitch and tries to make sure that the inside of his big toe lands on the T line.